Title: 'Nieuwe en seer Accurate Paskaart van het Eyland Yslandt In het Groot'. Printed in 1782, a scarce original chart of Iceland published by the renowned Amsterdam map and chart publishing dynasty founded by Johannes van Keulen. This chart replaced an earlier map of Iceland by Johannes' son Gerard van Keulen (1678-1727) that was based on the Joris Carolus map and was published in the early 1720s for inclusion in the profoundly influential book of sea charts known as the Zee-Fakkel, the first volumes of which were published in 1681. 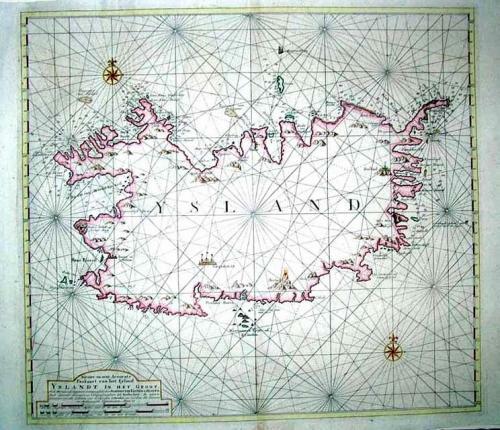 The chart was likely engraved in the early 1750s as it is consistent with other Dutch sea charts of Iceland issued in that period with a more accurate depiction of the western fjords. Van Keulen's heirs were still publishing the Zee-Fakkel well into the 19th century as it eventually came to comprise over 400 charts; this example is from a 1782 edition. The chart is extremely scarce - it is not recorded in the Antique Map Price Record, only two examples from institutional collections in the IKAR database, one example in the National and University Library of Iceland. In overall excellent condition with a strong impression and a prominent platemark and wide margins on fine quality laid paper. Some minor diagonal creases are present on left side of centrefold, and there is a secondary vertical fold to accommodate the map within a bound volume as it is larger than standard folio size. Some trivial browning to lower centrefold and margin from binder's stub on verso, one pinhole in margin, margin edges somewhat uneven with minor chips and fraying. Overall an exceptionally well preserved example of an extremely scarce chart will make a superb presentation if matted and framed.